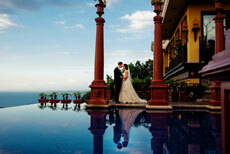 One of the most spectacular venues for your wedding is Villa Caletas and Zephyr Palace. They are located on the same property outside of Jaco. Getting there is part of the adventure driving up a long windy, palm lined road. Villa Caletas boasts 43 rooms/suites and 7 luxury themed rooms at Zephyr Palace. I would describe the architecture as neo-classical with French fusion. Villa Caletas has a Greek style amphitheater (perfect for wedding ceremonies). The design for Zephyr Palace was inspired by the Greek god of the west, Zephyros. This is the only hotel I've been to where each room is different. Comfortable, inviting and each with a private outdoor space sets this resort apart from the competition. It isn't unusual to see toucans, scarlet macaws and other wildlife native to the area. Striving to be green the hotel has been involved with sustainable tourism and has obtained 4 leaves out of 5 through the Tourism Board (Certificate of Sustainable Tourism Program). Besides a luxurious stay you can support their goal to be ecologically neutral and reduce your carbon footprint. This program goes from not using chemical pesticides, having their own garden and helping the local community. Saving water, electricity, and recycling promotes a greener future for our planet. Villa Caletas has 3 venues for wedding ceremonies. The most impressive is the amphitheater. The background is the ocean behind the Greek columns. Dinner is served at the restaurant with dancing on the attached patio. It's breathtaking. Another option for a smaller event is the enclosed Mirador Terrace. 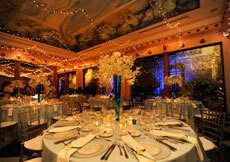 You'll be able to have the ceremony and after the space will be transformed into the reception. A new terrace has just been added which is perfect for an elopement or wedding group under 20. All the areas have views of the ocean. Zephyr Palace is located 350 feet above the pacific ocean. Most of the ceremonies take place in front of the infinity pool. You're just steps away from the reception. This area is perfect for large groups. There is even a private disco for the after party. 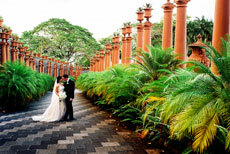 Besides the unique architecture what make this resort the perfect place for your wedding is the service and quality of the food. Besides awards for sustainable tourism you will find this resort mentioned in Condé Nast (Top 5 hotels in Central America), Trip Advisor (Traveler's Choice), and World Travel Awards.